So, I bought an ukulele yesterday. I was up late Saturday night, practicing guitar and cruising GuitarCenter.com for a new deal when I clicked the link for ukuleles. I’d been thinking about picking one up for a while, since it’s supposed to be easy to play- and easier still if you play the guitar. Plus, I’m from Hawaii and everyone and their aunty plays, so I thought I’d better get on board (finally). Let me tell you guys: it rocks! I’m still a novice guitarist, but I found the ukulele really easy and fun to play. I’m definitely going to keep at it while I fine tune my guitar skills. While I was looking for songs to learn, I remembered one of Hawaii’s great uke players, Jake Shimabukuro. This guy has been a part of Hawaii’s music scene since 1998 when his band, Pure Heart, snagged several Na Hoku Hanohano awards (Hawaii’s Grammy). As a solo act, he won international acclaim when a video of him performing a cover of “While My Guitar Gently Weeps” went viral on YouTube. Bonkers, right? It’s no wonder that he’s traveled the world over performing with super stars like Bette Middler, Yo-Yo Ma, Cyndi Lauper, and Ziggy Marley. He’s so fun to listen to because it really sounds like he’s playing with– not just playing on the instrument. His music can really kick start a lazy Sunday morning! By now I’m sure everyone has seen numerous reports about the massive earthquake and tsunami that hit Japan yesterday. In the aftermath of that quake, Hawaii and other locations in the Pacific basin were on tsunami watch. My grandpa woke me up (at 4am!) and told me to turn on the TV and call my parents, who still live in Hawaii. The next couple of hours went by in a blur. I sent texts to my parents, friends, and The Boyfriend. I was glued to CNN. I checked Twitter every 20 seconds for updates. Visit http://www.americares.org to donate. AmeriCares is a non-profit organization that provides immediate humanitarian relief to victims of disasters all over the world. Text “REDCROSS” to 90999 and give $10, which will be added to your phone bill. Click here for more info. Help the International Medical Corps send relief teams and supplies by calling 1-800-481-4462, or click here. There are tons of places to donate and ways to lend a hand. Remember to research and keep tabs on your donation to make sure it’s put to good use. I like Charity Navigator, which is a website that ranks charities based on effectiveness. Gung Hay Fat Choy! Today is the first day of the new lunar year, according to the Chinese calendar. I’m a big lover of astrology and the Chinese zodiac because they are really fun and interesting- regardless of how much stock you put in them! According to a recent poll, though, about 30% of Americans believe in astrology, so I guess a lot of you do put some stock in the stars. If you’re unaware, today marks the start of the Year of the Rabbit, a peaceful year with a focus on family and home. Diplomacy and security are the words to remember this year as you deal with others. This is the year to pinch pennies and learn to live with less, because next year (The Year of the Dragon) should be somewhat chaotic. For those born in the year of the rabbit, this should be an especially lucky year for you (Rabbit people are lucky anyway). I know that both times it was my zodiac year, I had some of the best luck ever! One of the best things about Chinese New Year is the massive celebrating that happens. When I was a kid back home in Hawaii, this was one of my favorite times of year. I would stuff my face with dumplings, light firecrackers until I couldn’t hear my own thoughts, and dance along while watching the Dragon Dances in the streets. If it was a very lucky year for me, I would get a couple of red envelopes with money in them, which I would immediately spend on candy. I could reminisce for hours, but I won’t. I’m going to try and find a CNY party near me and hang out by the dumplings! Have a great day everyone, and here’s to a new year! It’s been over a week since I returned from my trip to Hawaii, and I still haven’t got both my feet in Florida. I miss home so much. I miss the people, the food, weather- everything. I really miss the music, too. In Hawaii, there’s a heavy Reggae influence in music. I don’t think I’ve ever heard Reggae played on the radio here in Florida, but back home there are several stations that can be counted on for some Steel Pulse, Marley, and Peter Tosh. In fact, the influence has led to another genre unto itself. This style, called “Jawaiian” (stupid name, I know) combines Hawaiian music with Reggae -with a little roots thrown in. A relatively new act out now is “The Green.” Their self-titled debut was released in January, but I’ve only recently discovered them (since I don’t listed to Hawaii radio anymore). The album has a pretty varied sound. Standout tracks like “How Does It Feel?” have a kind of Acoustic Pop sound, while “Love I” is straight outta the ’90s with its synth keyboard and sound effects. While I enjoy the way “The Green” grooves, I wish the band had tried harder with the lyrics. It can sound juvenile at times, with some tired imagery (“Take a look at the sun that shines/ Painting colors of ribbons in the sky”) in “Alive,” and a couple of songs that kind of have a grade-school view of love. Still, this album is enjoyable the whole way through, and it’s a good addition to the Jawaiian catalog. Plus, as we finally get into fall here in Florida, it’s nice to hold onto some sounds of Tropical locales! Pick up The Green’s self-titled debut on iTunes now! Let me know what you think of this MM artist in the comments below. Happy Monday! I’m baaack! I’ve had a wonderful break back home in Hawaii. The wedding (my boyfriend was the Best Man) was beautiful and so much fun. I can’t believe it’s already over. But back to real life. And back to blogging! I’ll post some of the highlights of my trip later, but for now it’s Monday! You know what that means. . . This week I’m going to do something a little different. Instead of bringing you info about a newer artist, I’m going to bring you several amazing covers. If you don’t know, I have a deep love of Pop music, so I lourve to hear my favorite club bangers* and radio hits done in a new acoustic way. First up, it’s Tiffany Eugenio with her take on Usher’s “OMG.” This multi-talented Canadian takes the edge off this club hit by stripping it down to just her and a guitar (she also plays piano on other covers). Her voice has a kind of Sarah MacLachlan vibe that transforms “OMG” from Hip-Hop to an almost ethereal ballad. Long story short: It’s really pretty. Support Karmin by picking up their EP on iTunes! You’ve probably heard of Boyce Avenue. Their the most watched channel on YouTube, or something. Anywh o, they put up this version of Taio Cruz’s “Dynamite” a few days ago, and I’m a fan of it. It features bandmemember Alejandro singing and playing all instruments- cajon, piano, and guitar. Me likey. Btw, is it just me, or is cajon the most fun word ever? Sounds kinda dirty, right? Anywhoo. . . Finally, it’s George Azzi with an amazing cover Timbaland and Justin Timberlake’s “Carryout.” Not only can he play his brains out, but I’m pretty sure that he’s wasted in this vid. Just sayin’. This vid is a part of his “Undress A Cover” series, featuring acoustic covers of kinda ridiculous pop songs. I think it’s the best one. You can get Azzi’s EP, “Dark Rooms Have No Corners” on iTunes now! *This is not my term. I would never make up something so ridiculous. What did you think? Are these cover-artists the business or what?! Or should I take another long vacation so I can get it together? Let me know! Did you know that there’s a reboot planned of Hawaii Five-O? Me neither! This classic show is set to premiere on CBS September 20th. The new cast includes hottie Daniel Dae- Kim (of LOST fame), and Alex O’Laughlin- who will play the son of original series character Steve McGarrett. Taryn Manning (Hustle & Flow) will play McGarrett’s sister Mary Ann. Scott Caan (James’ kid), Jean Smart (Designing woman) and Masi Oka (YATTA!) are also cast. The new show will pretty much follow the premise of the old show- cops take down the bad guys in Paradise- with a few updates for the new millennium. It won’t be so much a remake as a reboot. Think the latest Star Trek film. 1.) Alex O’Loughlin? Who the eff is he? And why is he so hot? I will watch this show to stare at his face. And that accent? Excuse me while I undress. . . 2.) Is everyone on this show from a canceled TV show on another network? 3.) What about that updated theme song? I like it, but the YouTube trolls don’t seem to. Whatevs. It’s not like they can’t change it season-by-season, right? 4.) And, hey, um, I’m proof that there are black people in Hawaii. Can I be on this bad boy? For serious. Imma be there next month. Can a girl get a walk- on? What did you think? 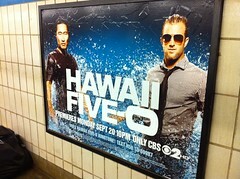 Will you be watching the new Hawaii Five-0? And did you see that guy at 1:43 get hit by that truck?! ZOMG I’m gonna watch just for that. ROFL! Being from Hawaii, I’m used to seeing terrible products marketed as “Hawaiian.” Mostly this involves slapping pineapple on something. A couple of days ago, however, I stumbled on something that takes it to a whole new embarrassing level.